WP 1 slider – is probably the most feature-rich Free WordPress slider plugin. After doing 1000s of WordPress websites for different clients, we came across with various slider requirements. From our learning – we developed the slider plugin with the most useful features, the variety of layout and configuration options and here it is – WP 1 Slider! WP 1 Slider – has been developed considering user-friendliness, layout designs, features, for various users. It is the perfect WordPress free slider plugin for your next website. So, don’t spend hours in configuring/making sliders on your website. Make it easy with WP 1 Slider. 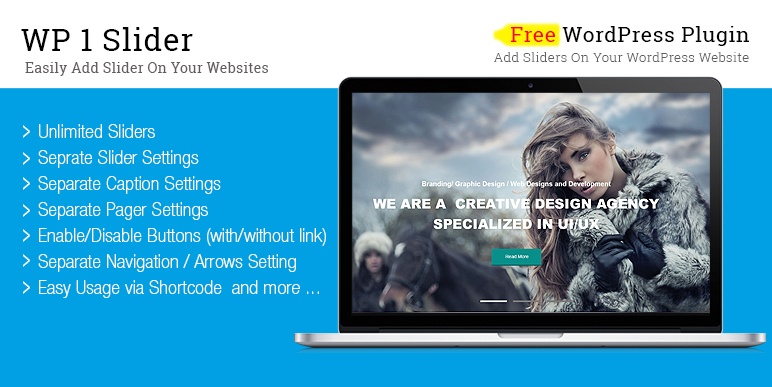 Hey Buddy!, I found this information for you: "Free WordPress Slider Plugin – WP 1 Slider". Here is the website link: https://access-keys.com/wordpress-plugins/wp-1-slider/. Thank you.